Continuing the trend of football coaches that also happen to be idiots, I bring you this week's idiot: Brad Childress. Personally, I could care less. As long as the Packers beat the Vikings on Sunday. I guess all the Vikings hate Childress because he is an idiot. PorkRice thinks he is a huge idiot. 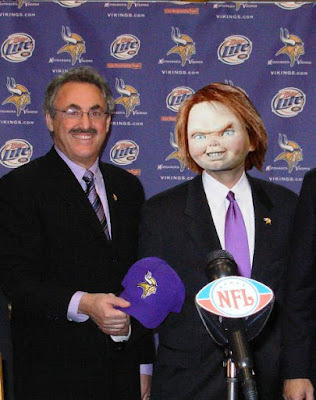 So much, in fact, that he already knows who will take over the helm for the Vikings next year. If you don't get the joke, he wants John Gruden to be the next coach. 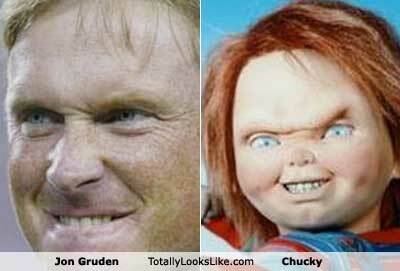 John Gruden looks like Chucky.